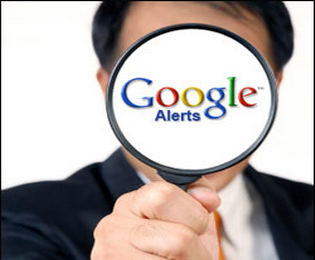 What is Google Alert API ? This is a free Google online service & automated intelligence Search Robot which gives opportunity to catch all the new information as it appears in the world web. Google alert is an intelligence modern technology to track your personal profiles and your entire web pages by receiving gets notifications email into your gmail account. How Does Google Alert Work ? As we have already discussed in the above para that it work as robot. It will find all the those locations on the web where there is something discussing about you or your blog which you have earlier selected by Google Alert. The only thing you will need to do this work just verify your blog name or your desire name with Google Alert API then you will easily get all the notification emails on daily basis what and where people talking about You or your Blog online. 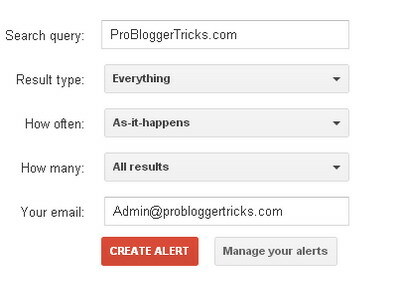 Once you create alert for special keywords like "Blog Name" or "Yourname" you will be automatically receive email updates to your gmail account when any person talking about You or your blog. To give you better example let explain with illustration. lets see if i wish to monitor my blog i will use "ProBloggerTricks" or "Hafeez Ullah Khan" to track what peoples are talking about Me all around the web. You could easily connect your self or your blog with Google Alert API for Triggering by following the below simple steps. Choose type it will be more better to keep it as Everything. Choose how often you want to get updates. Select only best result or All results. Now after completing the text box entries and click on the create alert buttons and do all the customization you will be notified by email whenever any one talk about ProBloggerTricks on the web. So in this way you could easily triggering your self or your blog that depends upon you. One things more you could also create multiple alerts for each case. wow ! This is the amazing post dear. Google is really the king of internet and it's products rock. Keep sharing wonderful things. Thumbs up for PBT. Thanks Mohammad Yaqoob You are the fastest to leave your valuable comments everytime. I really appreciate you and your work. So bro this was just little about Google API tool which help in finding our latest news. Thanks Bro and see you soon in my coming tutorial. I have read so many articles on your blog and i must say, you're a genius. Thanks for the info. Really a great post by you Hafeez Bro... You are always my favorite and you really pick a nice topic to share at PBT with your readers. Thanks To you my dear millions of times. Well this tools was published from google few years back but still thousands of bloggers do not aware of this nice tool. Thats why i was thinking why not to share a complete article about this tool. But there is something missing in this post i will soon publish them in next tutorial. have a great time with you on PBT. Yes Rizwan bro this is an awesome google tools which help in tracking those whom are talking about you and your website. Such a great tool. Thanks buddy. So many people were saying that it is not good is it right ?? Personally i fet that YBA is not good because the earnings is too low the RPM is is 1.5$ my google RPM is 3.5$ how crazy worst is this. Bro personally i have no interest in such advertise company. we will write a complete article after somedays. Really, I'm so impressed by your fabulous blog. I just want to congratulate you on the great design and high quality of content. Keep up the great work! This post helped a lot as I need to know who talks about my blog. Thanks so much for your valuable tips! I'm so happy to follow you! Nice post brother.amazing.... Thanks for sharing brother. Brother i want to ask a off topic question if you don't mind brother. How many visitor visit your blog daily? and please tell me drive traffic from Google search engine.Thanks in advance brother. Very nice Hafeez Bro. That is what we need to know about your Popularity in the of internet. I haven't used Google alerts yet but your article is very-well explained. I might give it a shot. That a very good thing to do, I will start using it.